Our goal is to make the Los Angeles region the most age-friendly in the world. Your input and suggestions will help us get there. Go to PurposefulAgingLA.com to take the Survey! Age-Friendly Communities allow older adults to “age in place”– through increased access to open spaces, expanded transportation options, better housing options, improved health services etc. 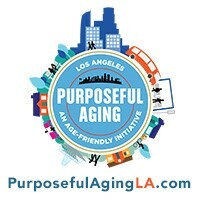 #PurposefulAgingLA wants your help on making #LACounty and #LosAngeles age-friendly. Take our survey at PurposefulAgingLA.com.